This delicious Italian white blend that comes in a fish shaped bottle is available for a limited time this year. 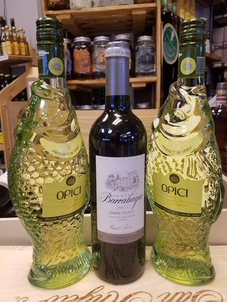 We love Opici, a blend of Chardonnay, Sauvignon Blanc, Trebbiano and Verdicchio. This wine appeals to just about everyone who has ever thought about drinking white wine. The bottle is traditional in the region of Marches, Italy ( and of course can be reused for table decor or other art projects). Barrabaque, a red blend from the left bank of Bordeaux is ready for your grilled meats this weekend. Try these wines tomorrow night at the shop and enjoy them for 15% off. My Civil War history knowledge is a little rusty these days. However, I knew the name P.G.T. Beauregard was one I had heard before many times when Gary Baron, the owner of Nashville Jam Company sent me this drink recipe for Beauregard’s Breakfast. Before you go making the drink, how about a word on the man it is named after? If you have ever walked the streets of Charleston or Richmond and gazed in wonder at the 18th century buildings, well, you can thank Pierre Gustave Toutant Beauregard, known as P. G. T. or G. T. Beauregard. He defended both of these cities during the Civil War. Beauregard ordered the first shots at Fort Sumter in 1861. Later, as Brigadier General, he led at Shiloh, the Seize of Corinth and at Richmond, VA. He returned to protect Charleston from Union naval and land attacks before he eventually convinced Jefferson Davis to surrender to General Grant in 1865. G.T. Beauregard surrendered to General William T. Sherman in 1865 in North Carolina. The Louisiana native then returned to Louisiana where he became quite successful in the railroad business and the lottery. I don’t know what he drank for breakfast, but this drink seems to befit such an emboldened character. The Italian bitter apertif, Amaro and the local blueberry jam from Nashville Jam are pure poetry. We will be tasting this cocktail on Saturday at 2 PM. Swing by and enjoy discounts on all of the ingredients. Mix this up to liven up your tailgate or brunch! Put all of these ingredients minus the lemon twist in a shaker with some ice. Shake well and pour over ice or in a chilled glass of your choice. Garnish with a lemon twist. Get ready for the heat wave with a chilled beverage made from one of Lebanon’s finest products, Nashville Jam! Gary and Courtney Baron make their delicious jam right here in Lebanon. We are proud to sell these yummy jams in the shop. The Strawberry jam makes an excellent bourbon themed cocktail. Shake up a few and cool off this Summer. Keep it Local! Muddle all of these ingredients. Add ice and shake vigourously. Strain into a glass. You made add ice or some soda water if you wish for a lighter drink.